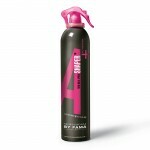 Thickening and volumising spray which offers extreme springiness to fine hair. A light spray which enables the hair to be worked only where it is needed and in any phase of the service. Spray onto wet hair from about 10-15 cm away, comb through to evenly distribute the product or partially direct it for targeted actions.